Western blot analysis of NTERA-2 cl. D1 cells (lanes 1 and 2), untreated (-) or treated with retinoic acid (+), and recombinant Xenopus histone H3 (lanes 3 and 4), undigested (-) or digested in vitro with Cathepsin L (+), using Cleaved Histone H3 (Thr22) (D7J2K) Rabbit mAb (top left), Histone H3 (D1H2) XP® Rabbit mAb #4499 (top right), or Oct-4A (C30A3) Rabbit mAb #2840 (bottom). Cleaved Histone H3 (Thr22) (D7J2K) Rabbit mAb recognizes endogenous levels of histone H3 protein when cleaved at Thr22. 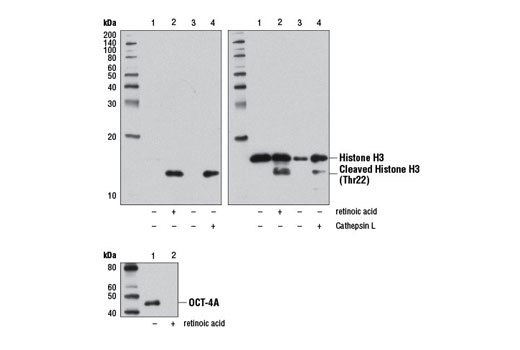 This antibody shows a strong preference for histone H3 protein when cleaved at Thr22, but also weakly recognizes full length histone H3. Monoclonal antibody is produced by immunizing animals with a synthetic peptide corresponding to residues surrounding Thr22 of human histone H3 protein. Modulation of chromatin structure has a critical role in the control of various DNA directed activities such as transcription, DNA replication, and repair (1). The basic unit of chromatin, the nucleosome, consists of two turns of DNA wrapped around two copies each of four core histone proteins (H2A, H2B, H3, and H4) (2,3). Amino-terminal tails of histones undergo various post-translational modifications such as acetylation, methylation, phosphorylation, and ubiquitination in response to physiological and environmental stimuli. These modifications modulate the accessibility of chromatin to effector proteins as well as act as binding sites for specific histone modification recognizing effector proteins that regulate gene expression (1,4,5). Such alterations in chromatin modifications and architecture that accompany gene expression changes have been observed during embryonic stem cell differentiation (6). One of the ways in which chromatin modifications may be altered in stem cells involves regulated proteolysis of histone H3 by Cathepsin L. Cathepsin L cleaves the histone H3 amino-terminal tail predominantly at Thr22 in differentiating stem cells, leading to removal of histone modification marks which could then influence the expression patterns of developmentally regulated genes (7). Smith, E. and Shilatifard, A. (2010) Mol Cell 40, 689-701. Kornberg, R.D. (1974) Science 184, 868-71. Kornberg, R.D. and Lorch, Y. (1999) Cell 98, 285-94. Gardner, K.E. et al. (2011) J Mol Biol 409, 36-46. Young, R.A. (2011) Cell 144, 940-54. Duncan, E.M. et al. (2008) Cell 135, 284-94.